Humbled by a disastrous and tragic opening of the Indianapolis Motor Speedway in August 1909 all the stakeholders of the Indianapolis automobile industry turned nervous eyes to a rival two-mile speedway in Atlanta as it prepared to stage its opening event November 9 through 14 of that year. The article contained in attachment Atlanta091509 was originally published in the September 15, 1909 Indianapolis Star. The subject was an intimidating rival to the newly, albeit tragically, christened Indianapolis Motor Speedway in its opening races the previous month. This was the Atlanta Speedway, a two mile crushed stone track that promised record breaking speeds. This ad for the National Motor Vehicle Company "40" model is a lift from the November 17, 1909 Indianapolis Star. The ad focuses on the performance of that model - although the company's "60" model is also mentioned - in the recent inaugural race meeting at the new Atlanta Speedway. This article was originally published in the January 30, 1910 Indianapolis Star. 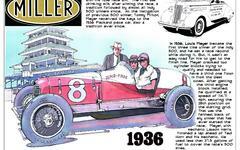 It describes a proposed speed duel special event at Atlanta Speedway between big foreign imports - the E.W.C. This article originally appeared in the January 9, 1910 Indianapolis Star. Originally published in the Sunday, March 20, 1910 Indianapolis Star, attachment Atlanta032010 contains an article that was part of a special supplemental section about the upcoming March 28 Indianapolis Automobile Show presented by the Indianapolis Automobile Trade Association (IATA). This article first appeared in the April 28, 1910 Indianapolis Star. The attached article was a "special" to the Indianapolis Star and appeared in the paper on May 7, 1910. The attached article was published in the May 8, 1910 Indianapolis Star and summarizes the three-day race meet at Atlanta Speedway.